This has always been my pet theme of debate with many who grudgingly respect my principles but in the same breath think I’m foolish to let go a brilliant investment opportunity ! 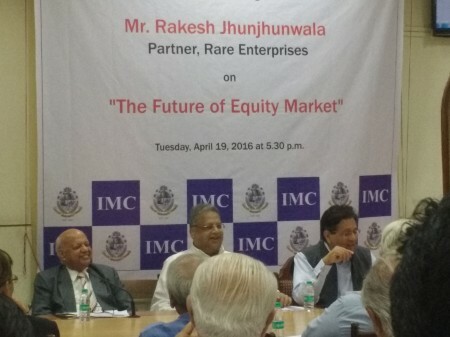 Methinks every Indian Equity Investor needs a dose of Rakesh Jhunjhunwala (RJ) every few years! ~ any sooner it could be an Overdose ! 😆 ~ just kidding ! I am delighted to blog he has not changed ! ~ shot straight from the hip & mouth again as he always does ” I’m a satodia(translated to mean speculator) & investor & not an economist” ~ his investment portfolio has spread into the Alternatives of Bollywood Movie Production too with Kareena & Arjun starrer ‘Ki & Ka’ being his latest co production~ is into horse racing too and owns a few horses ~ passions perhaps where return on investments need not be measured in monies !? On The Future of Equity Markets ~ Reiterates this is only the Trailer & we are going to witness a Mother of all Bull Runs.India is a thriving young Democracy with US $ 600 b in Savings every year.Equity Markets receive just US $ 50 b from this.This has to improve and it will ~ anyone ,any doubt! ?